I woke early to beat some of the fevered heat of the plains, the kind of humid blaze that leaves you soaked to the skin by mid-morning. The silhouettes of the Meteora were etched faintly against the night sky when a startling cry cracked the last of the darkness. As light seeped in from the east, other wolves joined the first, a chorus of mysterious howls funnelling upwards like smoke between the towering pinnacles, reflected and echoing off the encircling stone drums until it billowed into the air as if a sail. As the wolves moved off with the arriving light, sheltering from the sun that would soon burn across the sky, the stone pedestals and prominences of the Meteora took shape in the silence of their leaving, as if they’d been called into presence by those wild and plaintive songs. 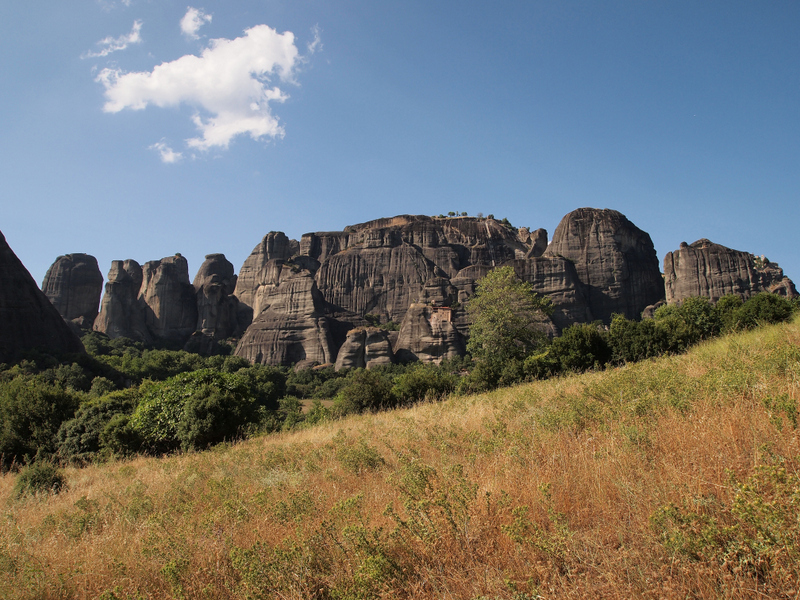 The nearest anyone has come to explaining the origins of the remarkable rocks of the Meteora – meaning suspended in air in Greek – is the German geologist Alfred Philippson. 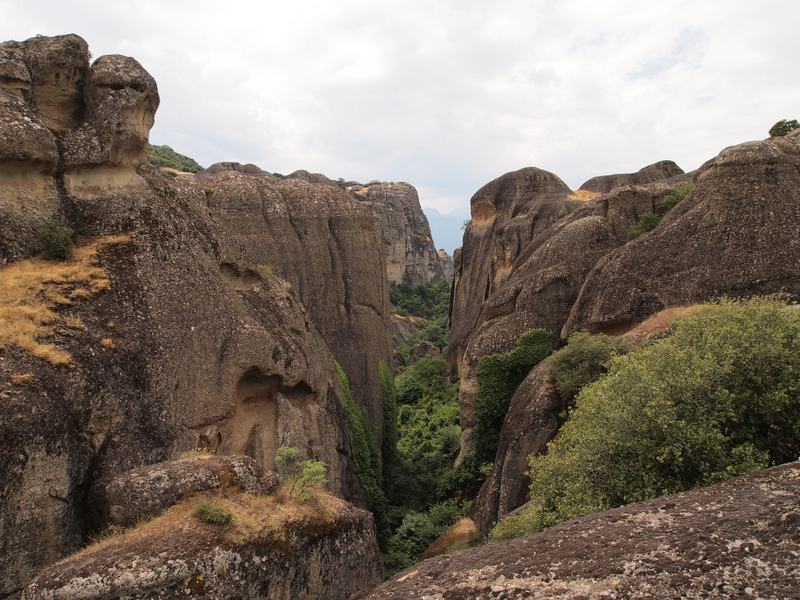 In 1897, he suggested that a river once ran into an ancient lake that covered what is now the plain of Thessaly, depositing in the same place where the Meteora have risen its rippling debris of silt, gravel, mud and water-smoothed pebbles and stones. Some 60 million years ago the river’s estuary was an alluvial fan that opened and spread from its point of entry into the lake. Over the course of thousands of years the layers of the fan deepened, eventually being compressed by the immense forces of water and earth into conglomerate – a type of sedimentary rock composed of the pre-existing stones that the river had washed into the lake – that was concreted together by hardened sandstone. When a massive earthquake emptied the Thessalian lake by cleaving open a channel to the Aegean Sea, the deltaic cone at the end of the river was raised from the lake bed into the sky. Loose sandstone was rinsed away by rain and the stone pillars were further worn into their present sinuous forms, riddled and pocked with caves and fault lines, by wind, weather and subsequent movements of the earth. The stones are beguiling in their shapes – an entrancing skyscape that lifts eyes from the surrounding plain to continually peer upwards into the vaulted air. It must have been this same numinous sensation, pleated together with a longing to be nearer the heavens, which enticed the first hermits to live precariously on the rocks. 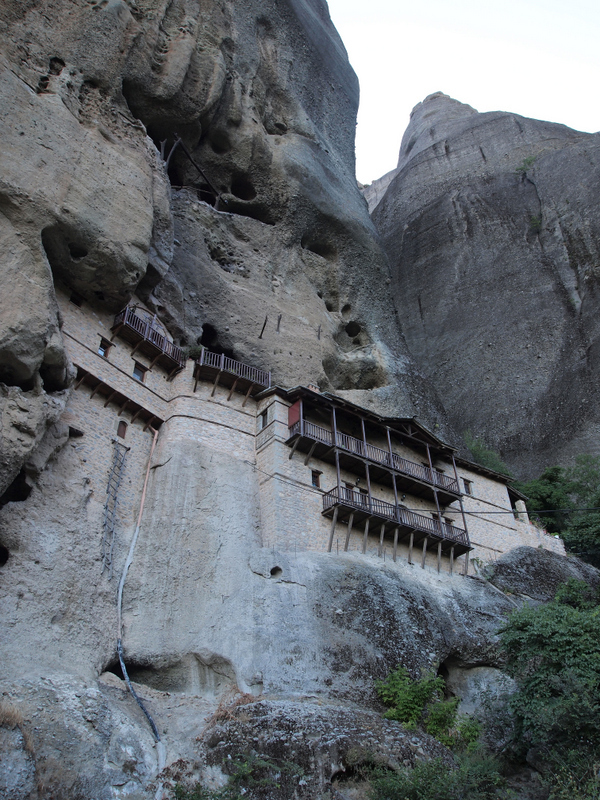 It’s impossible for me to even imagine how it might have been done, but from as early as the 9th century Orthodox hermits retreated into seclusion in the Meteora, somehow climbing these sheer towering stones to live inside the clefts and fissures of the cliffs. 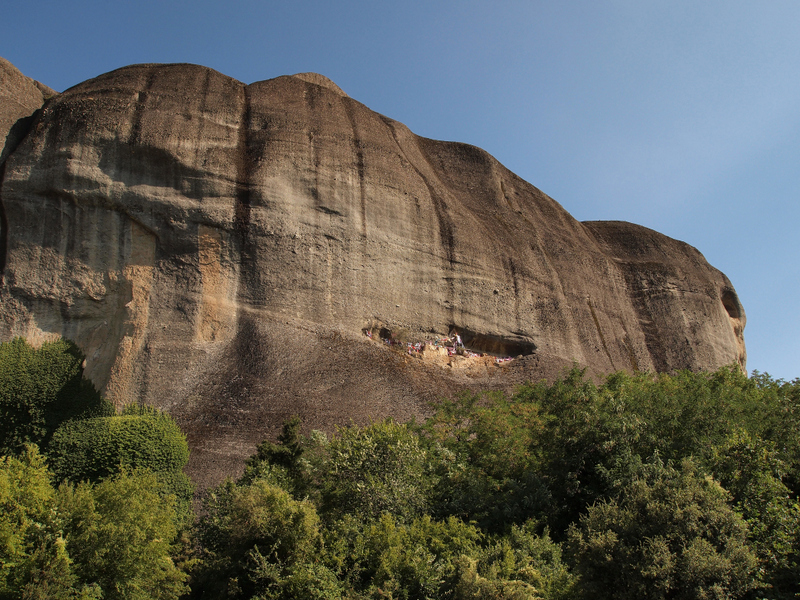 Like the peregrines, Egyptian vultures and black storks that still nest on the virtually inaccessible rock faces, they became sky dwellers, at home in a world of soaring stone. 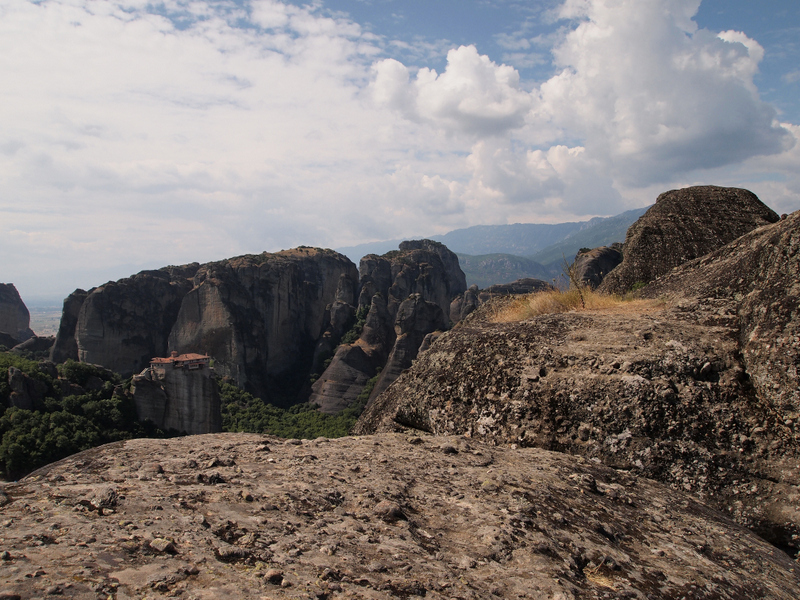 By the 14th century the hermitic community at Meteora had become so large that monasteries were founded on these high pedestals and plinths. 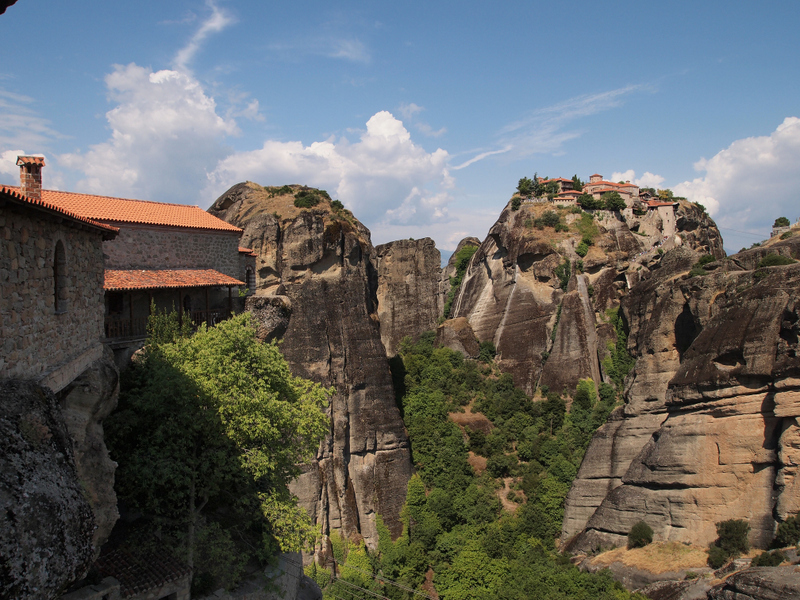 As a measure of how bewildering the ascents – let alone the construction – would have been, St. Athanasios Meteorites, the founder of the first monastery, the Transfiguration of Christ, was said to have reached the top on the back of an eagle. 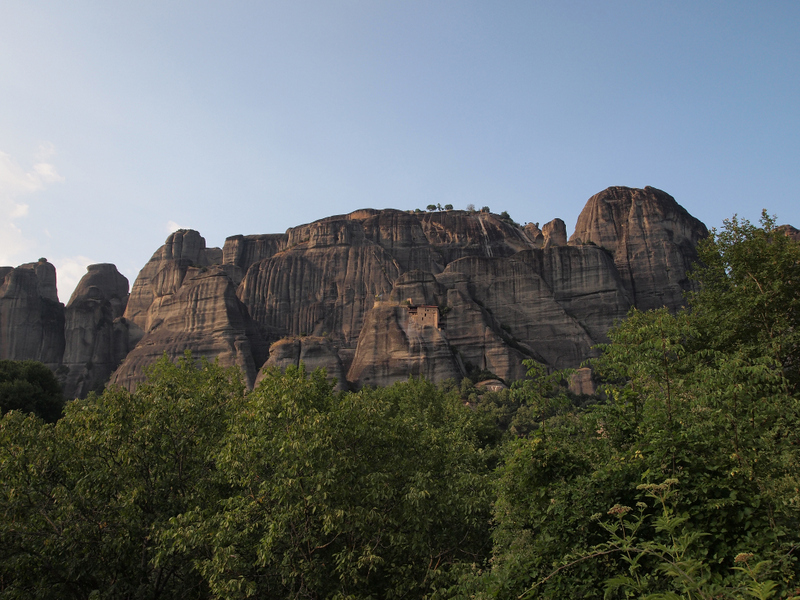 A conservationist I spent time with in the Meteora told me that when rock climbers – using all the modern equipment and technology available to them – finally ascended one of the highest and most demanding pillars in recent years they found tortoises roaming its grassy top. It’s believed they were placed there by monks who had somehow ascended the sheer wall of stone as potential food sources during long seasons of solitude. Since then the fortunes of the monasteries have radically changed, though there can’t be many more monks or nuns living inside them than there were all those decades ago. 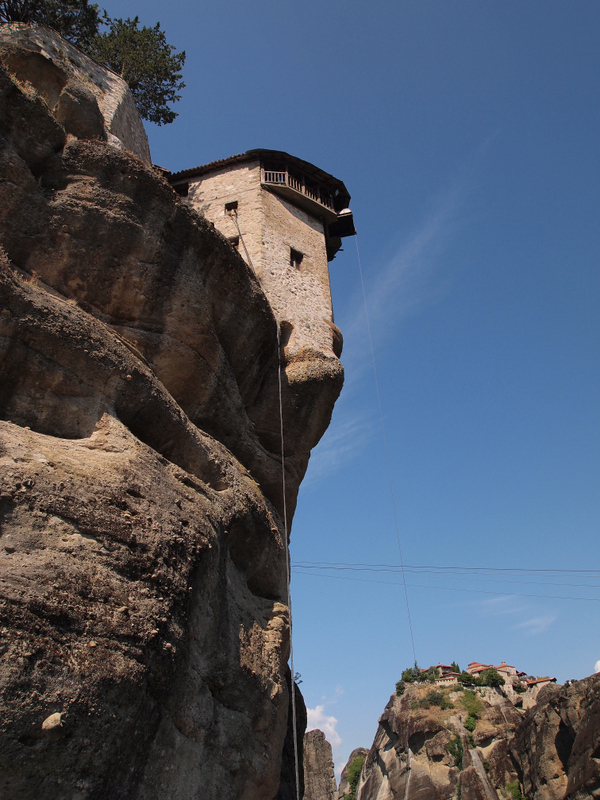 Instead the Meteora has become one of Greece’s premier tourist attractions. 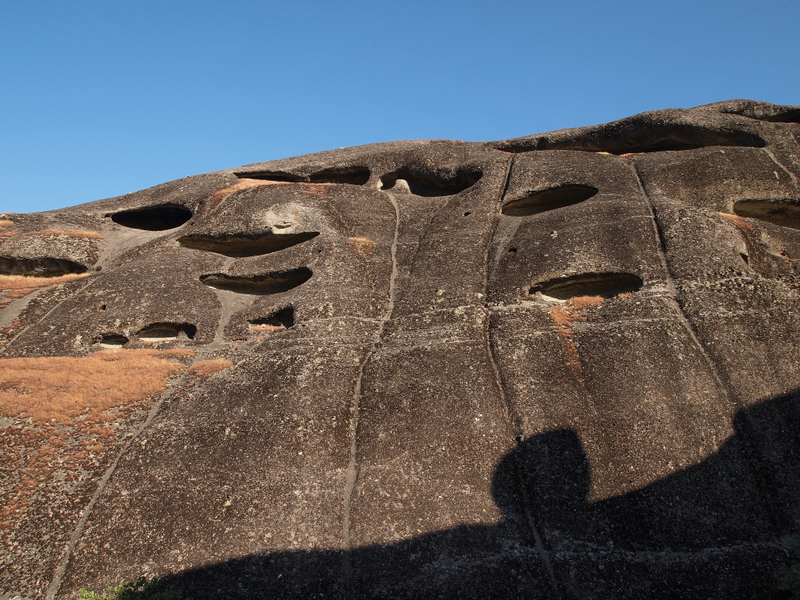 Listed as Unesco World Heritage Sites, they draw visitors from around the world to these rocks. 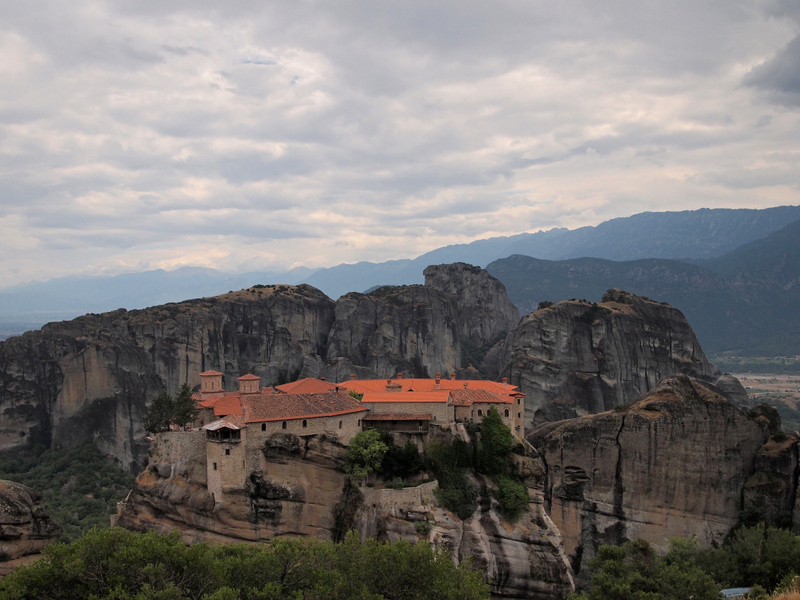 But after reading the chapter about the Meteora in Roumeli, I’d wondered what might still be found of the old monastic tradition. In an out-of-date guide book to the region I’d seen that a solitary monk was, at the time of publication at least, in attendance at a remote and rarely visited monastery on the far side of the soaring dark rocks and so I left the crowds for a path that swung clear across a hill of burnished grasses smouldering golden under the sun. A procession of old and knowing tortoises kept me company on the way. I walked out along piers of dark stone, tracing my fingers over the pebbled surfaces, and looked out across the distant plain shimmering in haze. 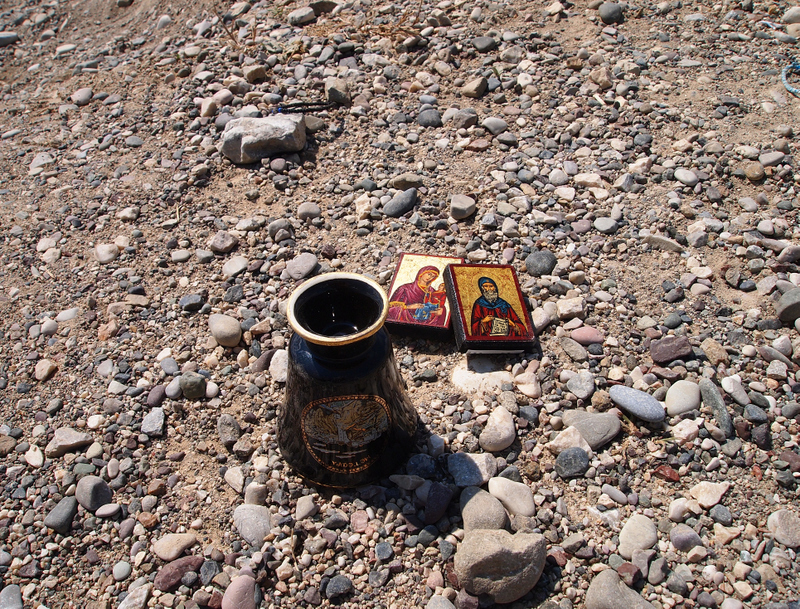 I passed the ruins of earlier monasteries and hermitages, their long abandoned shells clinging to the edge of canyons. Alpine swifts, peerless in their artful swirl about the high crags, danced at the tapered edge of the sky and ant-lions flared from the grasses like blown glass, their translucent wings lifting and spinning, glittering helicopters of light. I weighed down the envelope with a stone, the tip of a black Bic pen poking from a corner. There are still some, it appeared, willing to dwell nearer the sky, at least part of the time. I descended the steps and took a last long look at the monastery, the elegant Byzantine brickwork of the church and living quarters recently restored. It inhabited the rock as if indigenous, as suited to the cliffs as vultures and eagles perched on the rim of their caves and ledges. Stone become home. I turned onto the path as dark clouds eclipsed the sun and threatened rain. It was time to cross this ancient stone estuary again, to be deeply engaged with this improbable geology. Astonishing and beautiful. Thank you. Many thanks, David. It’s a remarkable place on so many levels. Delighted you enjoyed the post, and hope all is well with you. 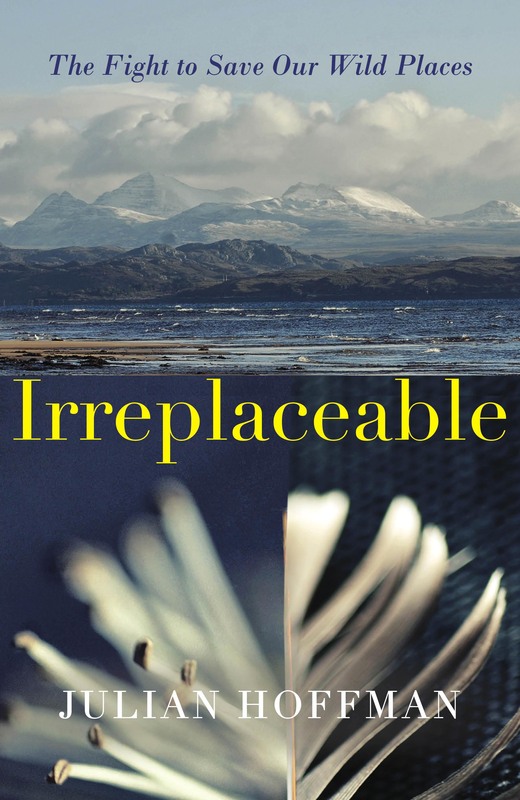 What David Haskell said…also I am reminded of Aran Islander Liam O’Flaherty’s fiction wherein there is a retinal immediacy that allows no feigned line between nature and man. Many thanks for reading and leaving a comment, Michael. Delighted you enjoyed the post. I don’t know O’Flaherty’s work very well, but this remark of his reminds me of the writings of Tim Robinson on the Aran Islands – further evocations from the weave of nature and man. What an incredible landscape Julian and a wonderful account of the sky dwellers of the soaring stones. As always, many thanks for your kind words, Fifepsy. Delighted you enjoyed this journey to the stones of the sky. If for nothing else you write beautifully ! That fact that you traveled there on some quest says something of who you are, what you are searching for! Beautifully done. The Photography is well done, and walks along with one has they read and experience what was and may still be. Many thanks for your kind and generous words, Jeff. 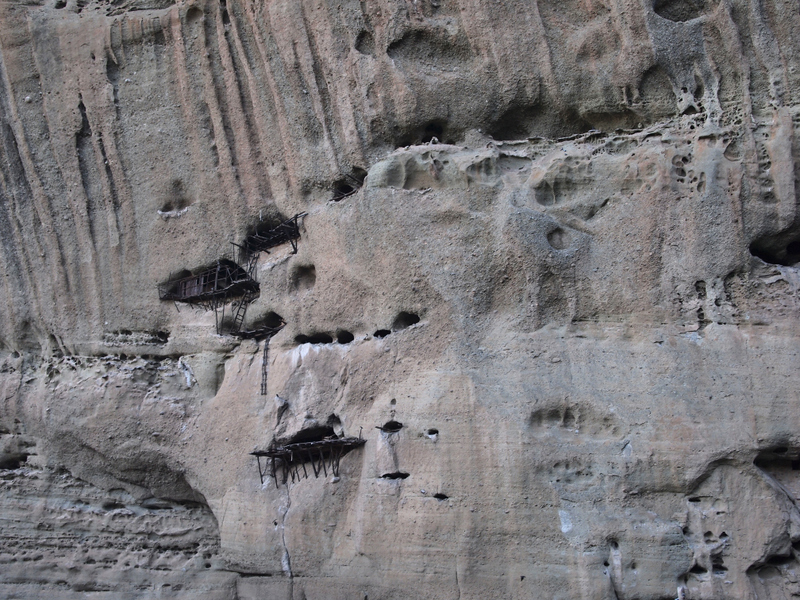 Along with wanting to see the Meteora monasteries again (I travelled there for the first time many, many years ago), I went in order to meet with a conservationist and see the endangered Egyptian vulture which nests on the cliffs. 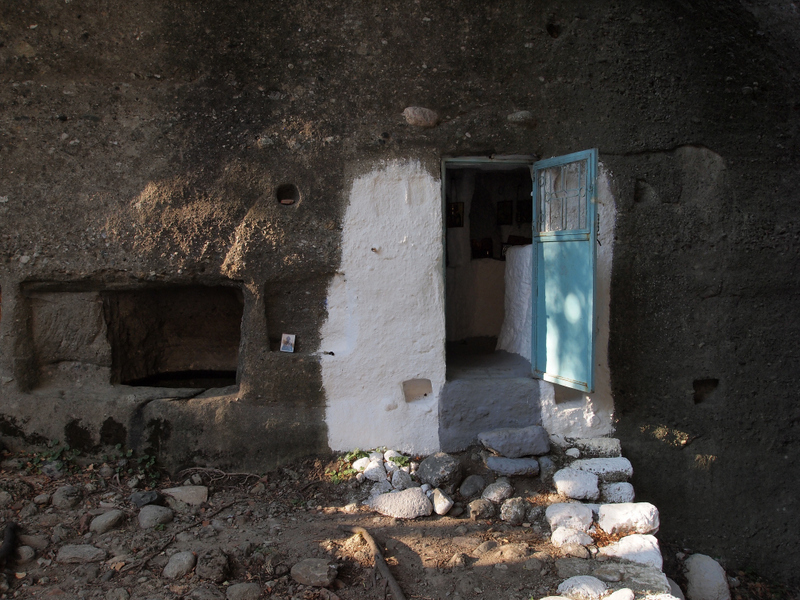 There are only 20 of these vultures remaining in all of Greece, and the precarious nature of their survival had its echoes in the preservation of the monastic tradition within these extraordinary stone dwellings. It was a place that moved me on a number of levels, so I’m delighted you enjoyed this brief journey into the sky. An amazing story, Julian. I’ve seen old postcards of the monasteries, from when my uncle was studying in Greece, but I hadn’t heard much about them. The rocks themselves, remind me of the hoodoos of southern Alberta, but much, much larger. 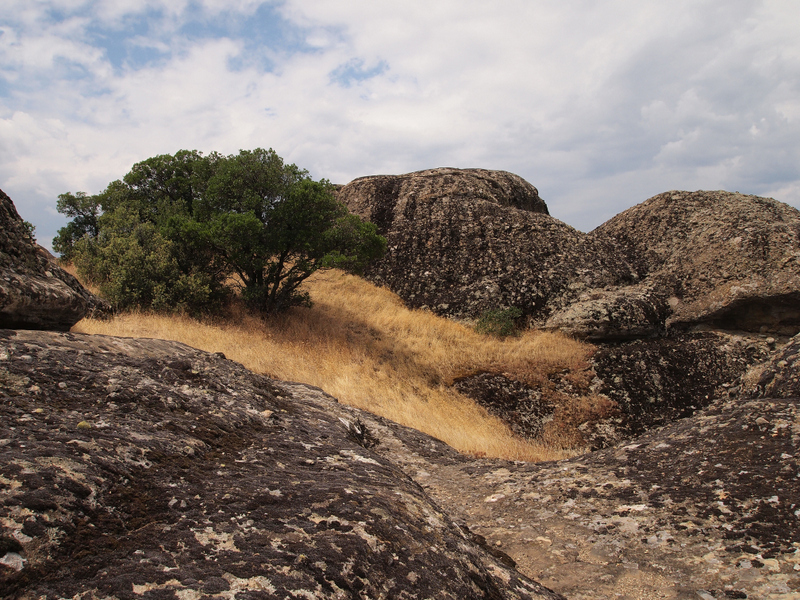 Thanks for sharing this remarkable area, both in terms of geological and human history. Thanks ever so much, Heather. I love the idea of you receiving old postcards of the Meteora! 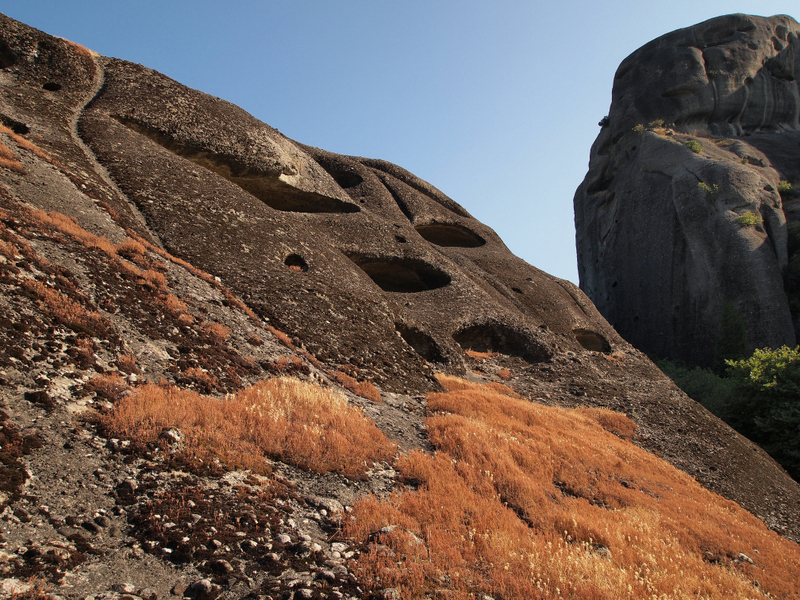 I’ve heard of the hoodoos and will have to look them up for a future journey idea :) You’ll also be interested to know that a few of the remaining 20 Egyptian vultures in all of Greece nest on these same high stones. That was the main reason for my journey – to see this endangered bird in a place worthy of preservation. The echoing connections between the vultures’ tenuous hold on survival and the hermits clinging to stone were strong. Indeed it is! Many thanks for reading. A wonderful piece Julian. 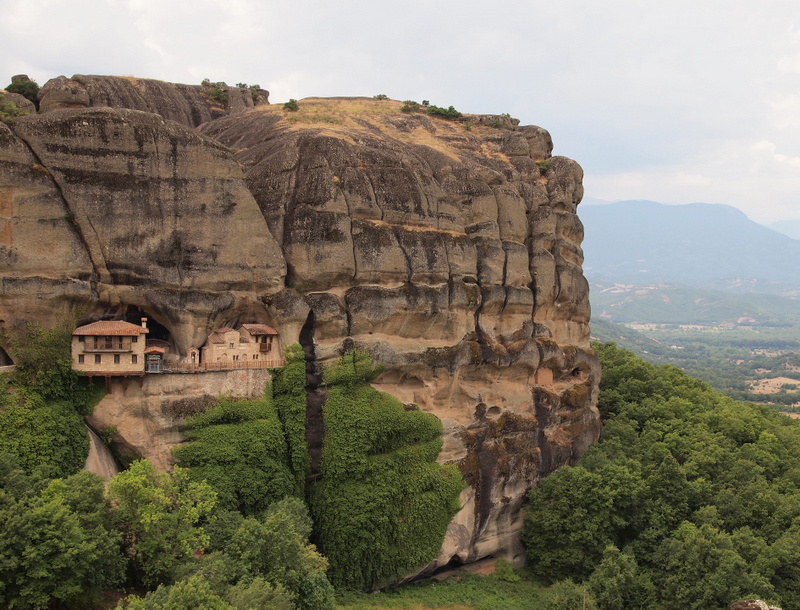 Some years ago we took my well-travelled brother to Meteora yet he was astounded by the sheer unlikeliness of both the geology and the monastic history of the place. Many thanks, Steve! Delighted you enjoyed it. It’s such an evocative place in so many ways. You might already know, but I was told that there are a few pairs of lanner in the area that use the cliffs to nest as well. A fascinating and beautiful place that I have never before encountered. Thanks for describing it in your inimitable way. The image of these formations being called into existence by the wolves’ song is so compelling and so appropriate for so magical a place. Thanks for the lovely words, Cindy. This was the first time I’ve ever heard wolves howl, so it seemed an apt setting for that extraordinary experience to happen. If you ever get the opportunity, I think you’d love this remarkable place. Thanks for taking the time to read and add your thoughts – always appreciated. I have had the privilege of listening to wolves howl in a high valley in mountain wilderness, sitting with my husband outside our tent in the midnight dusk. As they called to one another from ridge to ridge across the valley and the echoes reverberated around me, I felt an indescribable and unequaled response rise up within me. That memory, linked to this place of human habitation so beautifully synchronistic with the geology, as native habitation was in the Wilmore Wilderness where we explored with our horses, gave the Meteora a familiarity and brought home the global experience of humans with nature though history. 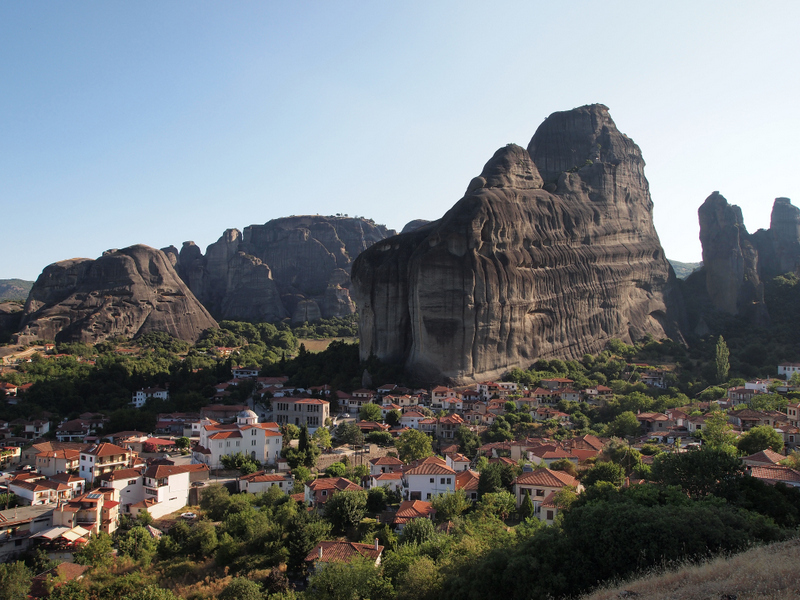 Great article, althought calling the Meteora rocks “stones” is an understatement! Cheers from Meteora! Many thanks! Delighted you enjoyed the article, though I have to disagree about the use of the word “stones.” I don’t think it’s an understatement at all. 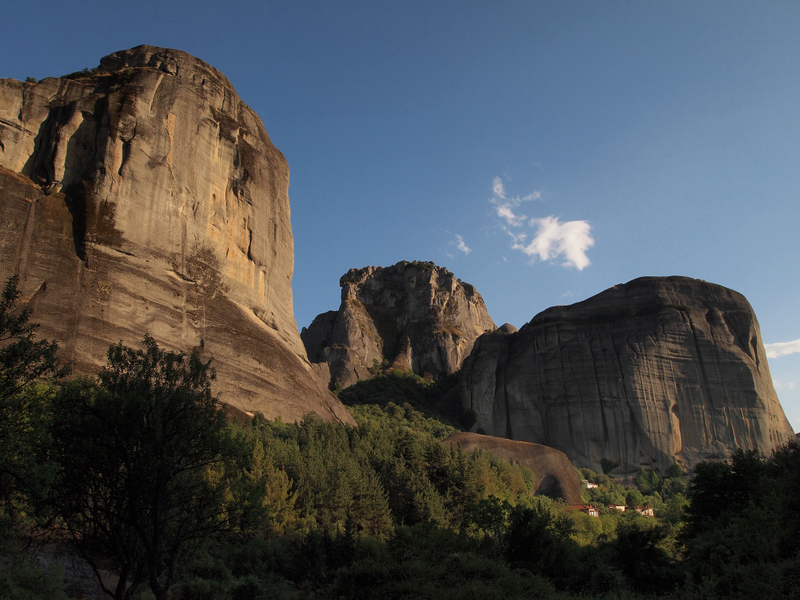 What I find most remarkable about the pillars of Meteora is that they began life as river stones that were eventually brought into the sky. That, for me, is one of the real beauties of the place – to run your hand over small pebbles and stones that were once part of an estuary, under water and great geological pressure. They became rocks eventually, but stones were the small and marvellous beginning of this extraordinary place. Such a tender and evocative note you found, though it only conveyed a message as commonplace as the finding of a misplaced pen! Yet the wording of it is sincere and moving, like the wording of this post. 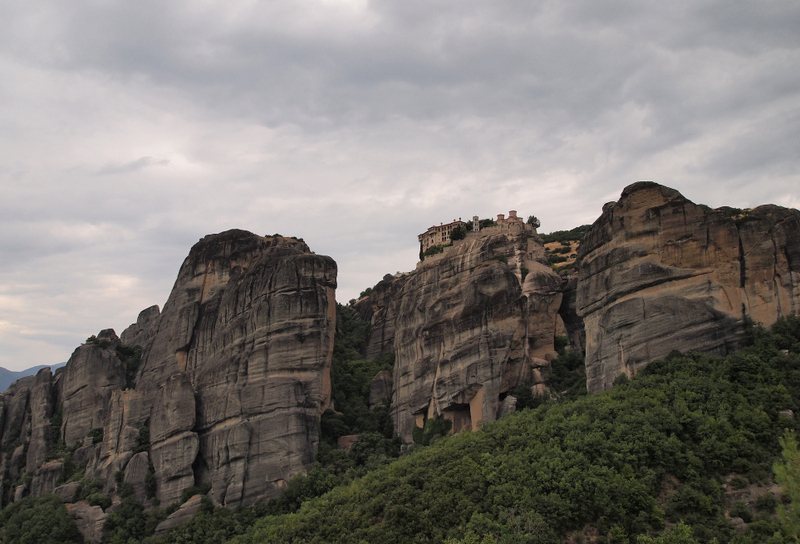 Also, I love the way the buildings grow out of the rock face; a birth fully made, like Athena from the head of Zeus. Many thanks, Aubrey. Like you, I was very moved by the note and the beautiful gesture it revealed. So simple, and yet so very thoughtful. It seemed to sum up the best of the monastic tradition. 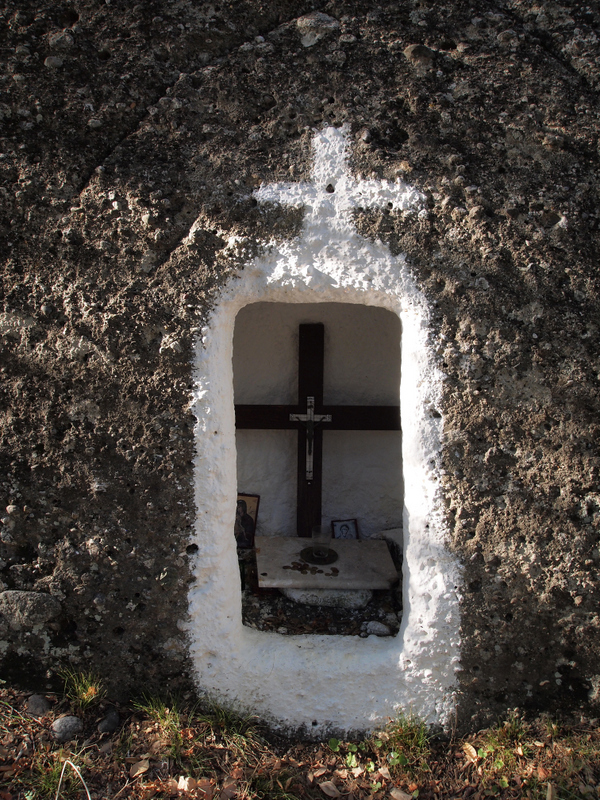 Hermits and ‘improbable geology’ – sounds like my idea of heaven! 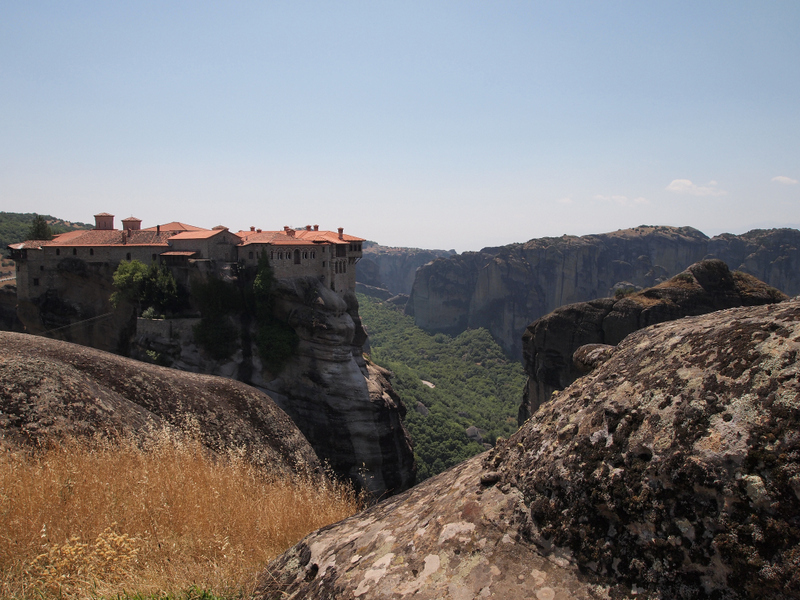 … Meteora is definitely a place on my list which I hope to reach and explore one day. A wonderful piece, Julian, and gorgeous photos. Inspired now to start planning my trip all the sooner! Thanks for the kind words, Tim! 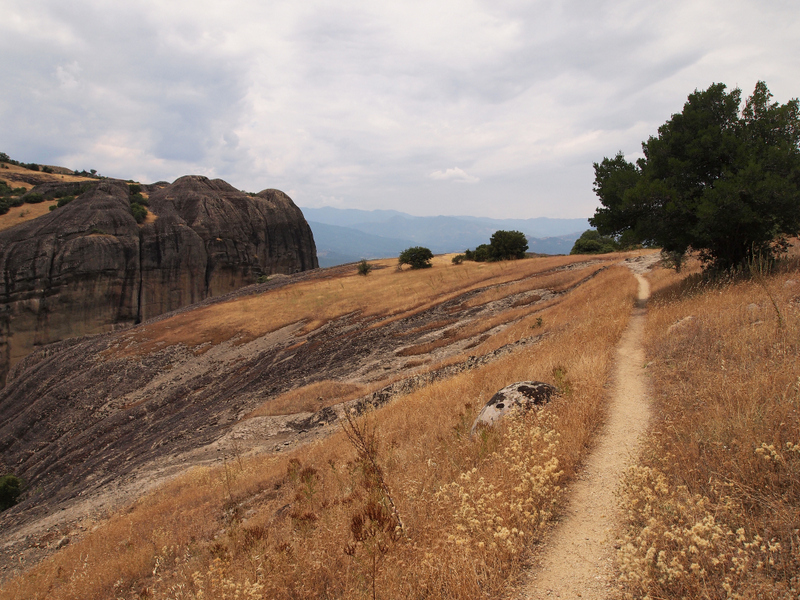 Delighted you enjoyed the post and photos, and I’m absolutely certain you’d love exploring the Meteora. Drop me a line if you ever have any questions about the place. Enjoy the planning! 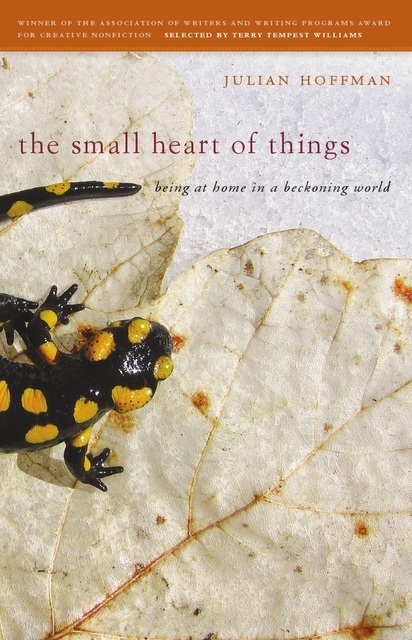 Thank you for sharing your journey to this remarkable place, Julian – the pictures are amazing and your words so poetic, as always… I’m sending this link to my geologist sister – I think she especially would find the geologic history fascinating – and I am drawn to the spiritual significance hermits and others have found here. So wonderful that you could explore a part of it without so many tourists present. Many thanks for your kind words, Barbara, and for sending it along to your sister. I was delighted to find a path away from the crowds and to sense something of the older atmosphere of this remarkable place. When is was still primarily a place of solitude. So pleased you enjoyed the read. Wonderful words and photography and reminds me of the Celtic saints who would maroon themselves in lonely, bleak island solitude off the coasts of Ireland and Scotland. Many thanks, Alex. I think you’re absolutely right in making a comparison with those remote island and spare coastal solitudes of the Celtic saints and hermits. A similar spiritual geography. I just want to echo what so many others have said. This is really wonderful – the photos, for sure & the story, explaining in such helpful detail what I’ve often heard about, but never before really stopped to learn about. You deserve all the praise offered here. Thanks ever so much for the generous compliment. I really appreciate you taking the time to stop by and read. Hope all is well with your own wild places this season. A remarkable landscape, Julian… and beautifully written about too. It brings to mind similar places I have visited – Greel Monasteries on the Black Sea coast of Turkey and Orthodox cave monasteries in southern Georgia. Such wonderful places were not chosen for spiritual contemplation purely by accident. And alpine swifts always know a thing or two. Many thanks, Laurence. I don’t know the monasteries of the Black Sea and southern Georgia, but you’ve certainly enticed me into finding out a bit more about them! I adore the common swift, but there’s something about the alpine swift – it’s swirling numbers; the audible wingbeats when scything nearby – that leaves me watching them for long periods of time without any thought of walking on. Beautiful creatures. Delighted you enjoyed the post, and hope all is well.